The intention of this review is to contribute to a better understanding of the potentials of the nutritional contribution of Aronia berries (Aronia melanocarpa). The paper gives a short background to their botanical classification and cultivation practice, going in detail to describe the chemical composition of the berries. The emphasis is laid thereby upon the phenolic constituents. The paper finally gives a short resume of their beneficial effects in biological systems in vitro, in animals, and in humans, thus underlining their medicinal potential. Aronia berries originate from the eastern parts of North America and East Canada , , . Their migration to Europe occurred around 1900 via Germany to Russia and back. Around 1946 the plant was established as a cultivar in the former Soviet Union. More recently it is cultivated also in East European countries and Germany (Oberlausitz) , . The genus name Aronia has been replacing the common name, chokeberry. Two species can be distinguished: Aronia melanocarpa [Michx.] Elliot (black chokeberry, Aronia noir) and Aronia arbutifolia [L.] Elliot (red chokeberry, Aronia rouge) . A third entity is intermediate and has variously been considered a species (A. prunifolia), a variety of each of the other two, or a hybrid . The other common names for Aronia besides chokeberries include black apple berry and rowanberries (Sorbus aucuparia L.), whereby in the latter case the hybrids of rowanberry with Aronia are likely to be addressed , , . Aronia is a member of the Rosaceae family, and the cultivars used for fruit production are from the species Aronia melanocarpa , , , . Cultivars have been bred for larger edible fruits and ornamental value. The plants have no known pest problems . Some cultivars are bred of true black chokeberry (Aronia melanocarpa) and some are hybrid cultivars (e. g., Aronia x Sorbus) , . The more important cultivars include ”Nero” (Czechia), ”Rubina” (crossing from Russian and Finnish plants), ”Viking” (Finland), ”Kurkumäcki” (Finland), ”Hugin” (Sweden), ”Fertödi” (Hungary) and ”Aron” (Denmark) . ”Viking” and ”Nero” are cultivars that are commonly available in North American plant catalogues . The Aronia shrubs can grow to a height of 2 – 3 m, which produce in May to June umbels of some 30 small white flowers, ripening to bright red (red chokeberry) or to purplish black berries (black chokeberry; Ø 6 – 13 mm, 0.5 – 2 g) , , , . Harvest is performed mechanically between August and September. Five to twelve tons per hectare can be expected in about five years, once plants have matured , . The effect of fertiliser rate on fruit quality parameters in the black chokeberry showed that an increased fertiliser application results in increased growth and higher yield whereas pigment content and total acidity decreased. Maximum production of anthocyanins per plant was obtained with a medium high fertiliser rate (50 kg N/ha, 44 kg P/ha, 100 kg K/ha) . The content of undesirable brown compounds and that of desirable anthocyanins is also dependent on maturation as documented in . A recent study illustrates that applied fertilization may exert a differential influence on the chemical composition of Aronia fruits especially with regard to sugar content and the quantity and profile of phenolics . Influence of microelements on accumulation of anthocyanins in Aronia melanocarpa fruits has also been studied . Originally the extended cultivation was developed due to the deep purple pigment resulting from their high content of anthocyanins and its consequent use as a natural food colouring . Beside the fresh berries even the extracts from the pomace resulting from the fruit pressing may be used as colouring agents . Concentration of anthocyanins by membrane filtration or separation and purification of anthocyanins by high-speed countercurrent chromatography has also been applied , , . Aronia is commonly used in different parts of Europe to produce fruit syrup, fruit juice, soft spreads, fruit jellies and tea. The tea is usually a blend with other more flavourful ingredients including black currant , , . Due to the harsh sour, somewhat unpleasant astringent taste and the bitter-almond smell of the raw fruit, there has been only limited use in industrial juice and fruit nectar production but application in blended juices is winning more and more consumer approval, e. g., with apple, pear or black currant berries , , . The Aronia berries are also used for liqueur and spirit production as well as ingredients of fruit wines . High yield of spirit with a good flavour and taste may be obtained during fermentation of Aronia , . The fundamental nutritional benefit of fruit and vegetables in the prevention of degenerative diseases has directed the attention of scientists and consumers to a variety of berry fruits and their constituents. Many of these fruits, including chokeberries, have a long tradition in European and North American folk medicine , , . The components of the chokeberries are dependent on a series of factors such as cultivar, fertilization, maturation of the berries, harvest date, or habitat/location as indicated above , . The chemical composition of berries or freshly pressed juice distinguishes from other berries by high contents of sorbitol and polyphenols , , . A detailed composition of the berries and juice is given in [Table 1]. A dry matter content of the berries between 17 – 29 % was reported, whereby some 5 – 10 % was identified to be water-insoluble material . * If not otherwise stated. NA, not analyzed; ND, not detected; DW, dry weight; FW, fresh weight. a Fresh pressed juice produced under laboratory conditions. b Commercially produced Aronia juice (100 %, pasteurised, not from concentrated juice). c Sum of single compounds determined by HPLC/DAD. d Folin-Ciocalteu method, concentration based upon gallic acid as standard. e Folin-Ciocalteu method, concentration based upon catechin as standard. The berries contained dietary fibre amounting to 5.62 g/100 g fresh weight (FW) . Fresh fruits have also been shown to have relative low content of pectin lying between 0.3 – 0.6 % , . NMR spectra of dietary fibre powders from Aronia led to identification of several constituents: microcrystalline cellulose, pectins, lignins, cutin-like polymers and condensed tannins. The fibre powders obtained from the berries contain significant amounts of anthocyanins, as indicated by their dark violet colour . In this context, the Aronia pomace preparations have been suggested to be a good source of dietary fibre containing high amounts of cellulose, hemicellulose and lignin . In addition, they may act as weak cadmium sorbents . The total content of organic acids is relatively low as compared to other berries and lies around 1 – 1.5 % of FW as reported in , . The main acids identified were L-malic acid and citric acid , . In freshly pressed juice prepared under laboratory conditions from different cultivars originating from different locations, the total amount of acids was found to lie between 5 – 19 g/L with L-malic acid being the main component. Details of the contents of other acids in the juice are given in [Table 1]. The resulting pH was observed to lie between 3.3 – 3.9, average values of 3.46 and 3.6 have been reported elsewhere , , , . The content of reducing sugar in fresh chokeberries was found to be between 16 – 18 % . According to other authors  the sum of glucose and fructose was determined to lie between 13 – 17.6 g/100 g FW, sucrose was not detectable. In freshly pressed juice, glucose (range: 30 – 60 g/L; mean: 41 g/L) and fructose (range: 28 – 58 g/L, mean: 38 g/L) were identified . Similarly, the mean amount of sorbitol was determined enzymatically to be 80 g/L in a freshly pressed juice and 56 g/L in a pasteurised juice , . Among a series of fruits and berries tested, Aronia was found to contain the highest concentration, suggesting its application as biomarker for juices blended with it (e. g., in the case of black currant) . Sorbitol is a sugar substitute often used in diet foods and is known to act as a weak non-stimulant laxative. The total fat content of the berries was analysed to be 0.14 g/100 g FW . The lipids of the chokeberry seeds were recently also evaluated to identify their main components . The seeds contained 19.3 g/kg glyceride oil with linoleic acid as the main fatty acid. The content of phospholipids in the seed oil, represented mainly by phosphatidylcholine, phosphatidylinositol, and phosphatidylethanolamine was 2.8 g/kg. The total amount of sterols was 1.2 g/kg dry weight (DW), the main component being β-sitosterol, followed by campesterol, stigmasterol and Δ(5)-avenasterol. In the tocopherol fraction (55.5 mg/kg) in chokeberry seed oil, α-tocopherol predominated besides β-tocopherol . The protein fraction of the berries has hardly been elucidated and the amount present has been summed up to 0.7 g/100 g FW . The content of amino acids has been determined with asparagine as the main component in the freshly pressed juice . The mineral content (ash values) of the fresh berries was found to be 440 mg/100 g  and 580 mg/100 g . Due to processing, the mineral contents of juices varied between 300 and 640 mg/100 mL , . The analysis of the individual macro and micro elements is given in detail in , , ,  and is summarised in [Table 1]. The Aronia juice showed relative high average amounts of potassium and zinc. Contents of heavy metals (Pb, Cd) in fruits of elderberry and black chokeberry may change depending on harvest site and vegetation period . Vitamins B1 (25 – 90 μg/100 mL), B2 (25 – 110 μg/100 mL), B6 (30 – 85 μg/100 mL), C (5 – 100 mg/100 mL), pantothenic acid (50 – 380 μg/100 mL) and niacin (100 – 550 μg/100 mL) were found in the freshly pressed juice . The vitamin content of different Aronia berries is reported in , . Besides these components, β-carotene and ß-cryptoxanthin were also found in comparatively high amounts , . Amygdalin, a cyanogenic glycoside isolated from the berries, is responsible for the bitter-almond smell of the fresh fruits. Prussic acid (hydrogen cyanide) may be liberated by hydrolysis through, e. g., heat or by endogenous enzymes present in the berries. Hydrogen cyanide is a colourless, very poisonous (LOLO < 1 mg/kg for adults), and a highly volatile liquid that boils slightly above room temperature . Aronia contains some amygdalin: 20.1 mg/100 g FW, juice 5.7 mg/100 g and the pomace 52.3 mg/100 g FW . Amygdalin is also called laevomandelonitrile, or laetrile for short. Amygdalin has been advocated by some as a ”cure” or a ”preventative” for cancer. Reviews of available clinical evidence recently published concluded that the claim that laetrile has beneficial effects for cancer patients is not supported by sound clinical data and that there is considerable doubt about its safety , . The presence of parasorboside, a characeristic compound of Sorbus species, was confirmed by  in Aronia melanocarpa Elliot, whereas  reported that parasorboside is not present in Aronia. The volatile constituents of black chokeberry were also analysed by gas chromatography and mass spectrometry. Concentrations of the 48 compounds identified were in general below their individual threshold values. The main compounds were benzaldehyde cyanohydrin, hydrocyanic acid and benzaldehyde . Furthermore, a series of benzene derivatives have also been reported as aroma substances like benzyl alcohol, 2-phenylethanol, phenylacetaldehyde, salicylaldehyde, acetophenone, 2-hydroxyacetophenone, 4-methoxyacetophenone, phenol, 2-methoxyphenol and methyl benzoate , . Perhaps the most important constituents present in Aronia, also responsible for many of its medicinal properties are the phenolic compounds. Aronia berries are high in content of procyanidins, anthocyanins and phenolic acids which will be discussed in detail in the following sections with regard to their composition, and physiological effects. The analysis of polyphenols causes many problems, since no uniform requirements exist. A broad spectrum of methods from simple spectroscopic assays to more sophisticated HPLC/DAD and HPLC/ESI-MS is available for the assay of the phenolic constituents, leading to differing, partly incomparable results. In addition to that, the methods are quite interference-prone and consequently lead to over- or underestimation of the contents . Besides the right choice of the solvent and extraction conditions applied, the removal of non-phenolic constituents has also been recommended , . An overview of analytical methods currently used for the identification and quantification of the polyphenols in berries, including an evaluation of their advantages and disadvantages is given in . Besides these analytical problems, as already mentioned the cultivar, harvest time, habitat, maturation and others also affect their content. To illustrate this complexity, the total phenolic content of Aronia berries has been determined to range from 3440 mg/100 g DW , 3760 mg/100 g of DW (cultivar ”Nero”) , 4010 mg/100 g DW , 4210 mg/100 g DW (cultivar ”Viking”) , to as high as 7465 mg/100 g DW  and 7849 mg/100 g DW . [Table 1] shows the total phenolic content in consideration of the used analytical method, [Table 2] summarises the content of the different phenolic constituents in chokeberries described in the literature so far. ND, not detected; Cy, cyanidin; Quer, quercetin; Pel, pelargonidin. a DW, dry weight; FW, fresh weight. Procyanidins (PCs) were identified as the major class of polyphenolic compounds in chokeberries . 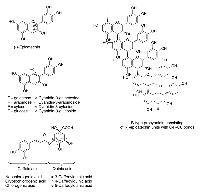 PCs are in general oligomeric and polymeric (epi)catechins ([Fig. 1]) formed from the association of several monomeric units: when 2 – 10 units are present, (epi)catechin oligomers are addressed, with over 10 units we speak of (epi)catechin polymers. The PCs differ in the position and configuration of their monomeric linkages, whereby C4′C8 and/or C4′C6 bonds are the predominant types (so-called B-type bonds). Aronia contain exclusively homogeneous B-type PCs with (−)-epicatechin as the main subunit monomer . The portion of catechin units is about 1.5 % . Galloylated subunits were not detected so far , . However, cultivars and genetic background were found to be a major factor affecting the PC content and profile analysis as well as systemic investigations including different Aronia species and cultivars are not available up to date. The PC composition in Aronia is reported as the following: monomers (0.78 %), dimers (1.88 %), trimers (1.55 %), 4 – 6-mers (6.07 %), 7 – 10-mers (7.96 %) and > 10-mers (81.72 %) . Total contents of PCs in chokeberries were determined to be 5182 mg/100 g DW [degree of polymerisation (DP) = 23] , 3992 mg/100 g DW (DP 14)  as well as 664 mg/100 g FW  by different authors. In the pomace the content of polymeric PCs was found to be 8192 mg/100 g DW (DP = 34)  and 5611 mg/100 g DW  and in juice 1579 mg/100 g DW (DP = 23)  as well as 3652 mg/100 g DW . Fig. 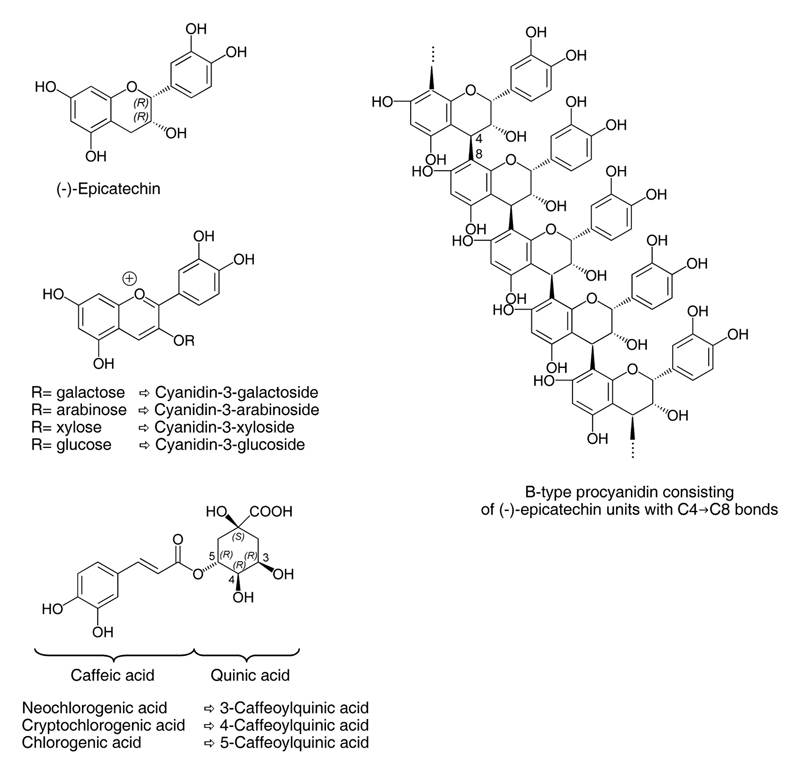 1 Chemical structures of major phenolic phytochemicals present in chokeberries. Increased content of anthocyanins ([Fig. 1]) is a major aim in black chokeberry breeding . This class of flavonoids is responsible for the pigments that give berries their dark red, blue, and purple colours. Aronia melanocarpa berries are one of the richest plant sources of anthocyanins, mainly containing cyanidin glycosides , , , . In chokeberry fruits, the anthocyanins represent about 25 % of the total polyphenols . The total anthocyanin content of freshly pressed juices (laboratory conditions using a garlic press) in eight genotypes (including the cultivars ”Aron”, ”Nero” and ”Viking”) of true black chokeberry from two different years was found to be 880 – 1400 mg/L in one year and 1290 – 1970 mg/L in the following year. This indicates that beside genotypes differences in ripening stage at harvest as well as cultivation condition, e. g., access to water, play an important role. [Table 2] summarises the anthocyanin content as well as the amount of single anthocyanins in the berries. Their concentration in pomace and juice was found to be 1837 and 1173 mg/100 g DW, respectively . In comparison with other berries and fruits, which are rich in anthocyanins, black chokeberries have a simple anthocyanin spectrum , , . The anthocyanin compositions in cultivars ”Nero”, ”Rubina” and ”Viking” are almost exclusively based on cyanidin as the aglycone structure: cyanidin 3-O-galactoside (68.9 %), cyanidin 3-O-arabinoside (27.5 %), cyanidin 3-O-xyloside (2.3 %) and cyanidin 3-O-glucoside (1.3 %) were identified , . The quantitative distribution is given in parentheses . The anthocyanin distribution pattern and succession order remains the same in berries, juice, and pomance . In trace amounts pelargonidin 3-O-galactoside and pelargonidin arabinoside were detected . In this context, it has been reported that the second and third derivatives of UV spectra may be useful as an analysis tool for identification of major anthocyanins from Aronia melanocarpa extract when using reversed phase HPLC . Anthocyanin extracts are increasingly used as food ingredients. A current challenge is to maintain their colour properties. Browning of fruit products is detrimental to the appearance since it results in an undesirable colour tinge. Browning is partly caused by enzymatic degradation of natural food colourants . Factors affecting the usage of extracts, in terms of colour hue and stability, have been revised . Chemical aspects of anthocyanin colour are summarised in this report and the advantages of acylation for colour durability has been recommended as a promising area for future development . At a given pH, colour stability mainly depends on the structures of anthocyanins and of colourless phenolic compounds. Colourants rich in acylated anthocyanins (purple carrot, red radish, and red cabbage) display great stability due to intramolecular copigmentation . For colourants without acylated anthocyanins (grape marc, elderberry, black currant, and chokeberry), intermolecular copigmentation plays a key role in colour protection. Colourants rich in flavonols and with the highest copigment/pigment ratio show a remarkable stability . In this context, it was found that chlorogenic acid, at concentrations greater than that of anthocyanins, enhanced the colour intensity of chokeberry juices as well as suggesting the participation of natural copigments present in fruits in the copigmentation process . By contrast, catechins appear to have a negative effect on red colourants, quickly turning yellowish in drink models. This effect is more pronounced when the pH is increased. Finally, colour does not seem to be greatly influenced by the addition of sugar . In a recent study, besides rowanberry, the best phenolic acid sources among berries were identified as chokeberry (96 mg/100 g FW) . This agrees with the reports where chlorogenic and neochlorogenic acids ([Fig. 1]) were determined as the main representatives in the berries (302, 291), pomace (204, 169) and juice (416, 393). The quantitative distribution is given in parentheses in mg/100 g of DW representing 7.5 % of the total Aronia berry polyphenols . The content of flavonols and (−)-epicatechin in Aronia is low compared to the other phenolic constituents described above. Flavonols represent only 1.3 % of the total chokeberry phenolics . Recently, five quercetin derivatives were identified: 3-O-(6′-O-β-arabinosyl-ß-glucoside), 3-O-(6′-α-rhamnosyl-β-galactoside), 3-O-(6′-α-rhamnosyl-β-glucoside), 3-O-β-galactoside and 3-O-β-glucoside . Their content was estimated to be about 71 mg/100 g FW . In contrast, only three quercetin derivatives [3-O-(6′-α-rhamnosyl-β-glucoside), 3-O-β-galactoside and 3-O-β-glucoside, their concentrations ranging from 13 – 27, 36 – 50 and 21 – 31 mg/100 g DW, respectively] were identified in the fruits, pomace and juice . In the same study the amounts of some unidentified quercetin derivatives were also given in the range of 27 – 82 mg/100 g DW . The data regarding the absorption and metabolism of the phenolic constituents (reviewed in , ) manifest their contribution to the health potential benefits of Aronia berries. Currently, there are no data in the literature about any unwanted and toxic effects of Aronia melanocarpa berries, juice or extracts . A recent book on Aronia melanocarpa summarises these effects excellently . The physiological and biological effects recorded in connection with the intake of PCs and chlorogenic acids ,  as well as of anthocyanins  have also been recently reviewed. The chemopreventive effects of berry phytochemicals in general were recently reviewed in . In the following we will mainly focus on studies in which Aronia was investigated. Since the accumulation of the data on available human clinical studies is limited, the most important potential health effects of Aronia have been discussed in detail in the following part on the basis of in vitro studies and where possible with inclusion of the data available from studies with rats, finally connecting them to those effects confirmed in human studies. A series of papers on Aronia investigate the antioxidant properties of Aronia juice, Aronia extract or its phenolic constituents using different well established in vitro assays. These assays include the inhibition of methyl linoleate oxidation , , oxygen radical absorbance capacity (ORAC) , , trolox equivalence antioxidant capacity (TEAC) , , , , ferric ion reducing antioxidant power (FRAP)  as well as the antiradical capacity using DPPH , , , , , . Fresh Aronia berries possess the highest antioxidant capacity among berries and other fruits investigated so far as measured with ORAC , , , , , , . [Table 3] summarises the data of the different publications. This result is also in line with data reporting that Aronia juice exhibits the highest antioxidant capacity among the polyphenol-rich beverages, with TEAC values that are four times higher than those of blueberry juice, cranberry juice or red wine , ,  (see [Table 4]). The most important compounds which are responsible for the radical scavenging activity seem to be the main phenolic constituents consistent with the observation that a good correlation exists between the total phenolic content and the ORAC or TEAC values of various berries and juices , , . Based on the ORAC values of single phenolic compounds reported by Zheng and Wang , the contribution of the anthocyanins to total antioxidant activity was calculated to be about 33 % for fresh Aronia berries and roughly 42 % for a commercial Aronia juice , . Information on the exact contribution of the oligomeric/polymeric procyanidins is not available but it may be assumed that their contributions are in the same range or even higher since procyanidins are the predominating phenolics especially in the berries . Beside their radical scavenging activity, procyanidins as well as anthocyanidins containing o-dihydroxyphenyl groups are excellent metal chelators and form complexes with, e. g., iron(III) and copper(II) . The presence of free state iron and copper in biological systems catalyses free radical reactions such as the Fenton reaction. The ability of phenolic components to bind bivalent transition metals effectively reduces the concentration of these cations and thus the extent of their prooxidative activity. However, it has to be kept in mind that in vitro data of the antioxidant capacity do not tell much on the role they may play in vivo to prevent oxidative stress . a ORAC, oxygen radical absorbing capacity. b Data expressed as micromoles of Trolox equivalents (TE) per gram fresh weight. a TEAC, Trolox equivalent antioxidant capacity. Data expressed as micromoles of Trolox equivalents per milliliter. Ranges are given in parentheses. A few reports also describe an antioxidant effect in an animal model, where chokeberry anthocyanins decrease lipid peroxidation and enhance the activity of enzymes which are involved in the antioxidant defence system , , , . One further study noted that the red pigment fraction of chokeberry fruits composed of cyanidin derivatives is a potent scavenger of DPPH radicals in both in vitro and in vivo systems and is able to prevent in a dose-dependent manner gastric mucosal damage that was induced by the subsequent application of ethanol . The authors suggested that one of the mechanisms by which the extract suppresses the development of the gastric mucosal damage is the scavenging of active oxygen by its cyanidin derivatives since the suppression of gastric acid secretion was not observed . An antioxidant effect was also found in humans, where a dietary supplementation with chokeberry juice limits the exercise-induced oxidative damage to red blood cells in rowers . Many reports suggest anti-proliferative or protective effects of chokeberries and/or chokeberry extracts against colon cancer on the basis of in vitro studies , ,  and in one animal study . An anthocyanin-rich extract from Aronia melanocarpa was shown to inhibit the growth as well as to stimulate apoptosis of human HT-29 colon cancer cells but exerted only little effect on the growth of non-transformed NCM460 colonic cells , . Interestingly, the chokeberry extract inhibited the growth to a greater extent than grape and bilberry anthocyanin-rich extracts when inhibition was compared at similar concentrations of monomeric anthocyanin . Another study demonstrated that the exposure to chokeberry juice inhibited Caco-2 cell proliferation by causing G2/M cell cycle arrest . Gene expression analysis revealed that the tumour suppressor carcinoembryonic antigen-related cell adhesion molecule 1 (CEACAM1), whose expression is known to be reduced in the majority of early adenomas and carcinomas, was up-regulated in the Caco-2 cells following repetitive exposure to dietary levels of chokeberry juice. The anticarcinogenic potential was further supported by data from an animal study using male rats treated with the colon carcinogen azoxymethane. An anthocyanin-rich extract from chokeberry inhibited the formation of the azoxymethane-induced aberrant crypt foci, a tentative marker of dysplasia and malignant transformation, and decreased the colonic epithelial cell proliferation rate as well as the faecal bile acid concentration . The data go in line with recent studies reporting that isolated cyanidin 3-O-glucoside exhibits chemopreventive activities , . Phenolic compounds isolated from berries of Aronia melanocarpa also exert an antimutagenic activity as documented in , . Anthocyanins isolated from Aronia markedly inhibited the mutagenic activity of benzo[a]pyrene and 2-aminofluorene in the Ames test as well as in the sister chromatid exchange assay with cultured human lymphocytes . Furthermore, Aronia juice intake was shown to inhibit the endogenous generation of N-nitrosamines in rats treated with aminopyrin plus sodium nitrite. In consequence, histopathological changes observed in livers of rats fed with nitrosamine precursors were prevented by co-treatment with Aronia juice . In an animal study, anthocyanins from chokeberry decreased the toxicity and accumulation of cadmium in the liver and kidney of rats receiving both these components in their diet . It may testify to the possibility of anthocyanins chelating metal ions which in consequence may decrease the damages caused by cadmium. Interestingly, a hepatoprotective effect of Aronia juice was also observed in rats after acute exposure to carbon tetrachloride (CCl4) . The liver cytotoxicity from CCl4 is dependent upon its metabolism by cytochrome P450 to highly reactive trichloromethyl free radicals. The reaction of the CCl3 radical with oxygen initiates lipid peroxidation which results ultimately in the cell death. Aronia juice prevented the CCl4-induced increase of lipid peroxidation as measured by the malonodialdehyde content in rat liver and plasma. One might conclude that the ability of anthocyanins and/or other phenolic constituents to scavenge free radicals is mainly responsible for the observed effect. Aronia can positively influence several risk factors for cardiovascular disease. In vitro experiments demonstrate that the phenolic constituents contribute to the protection and restoration of endothelial cells and consequently to their function , . Furthermore anti-platelet effects ,  as well as vasoactive and vasoprotective properties in porcine coronary arteries were observed , . In an experimental model of hyperlipidaemia in rats Aronia fruit juice hindered the dietary-induced elevation of plasma total cholesterol, LDL cholesterol and plasma lipids , , . In men with a mild hypercholesterolaemia regular chokeberry juice drinking (250 mL per day) for six weeks resulted in a significant decrease in serum total cholesterol, LDL cholesterol and trigylceride level whereas the HDL2 cholesterol level was increased. Furthermore a moderate but significant decrease in serum glucose, homocysteine and fibrinogen concentration was noted . The metabolic changes were associated with a reduction in systolic and diastolic blood pressure by a mean of 13 and 7 mm Hg, respectively . A similar hypotensive effect of a flavonoid-rich extract from chokeberry fruits was lately observed in patients after myocardial infarction, treated simultaneously with statins and in patients with diabetes mellitus type II , , . Other effects studied include enhanced reduction in cardiovascular risk markers in patients after myocardial infarction suggesting a possible clinical use for secondary prevention of isachaemic heart diesease . Research of other authors has demonstrated that Aronia melanocarpa anthocyanins might be useful in the prevention and control of diabetes mellitus type II and diabetes-associated complications , . In an animal model the administration of Aronia fruit juice to diabetic rats appeared to attenuate hyperglycaemia and hypertriglyceridaemia . In a human intervention study the daily intake of 200 mL Aronia juice over a period of 3 months was effective in lowering fasting glucose levels in patients with non-insulin dependent diabetes. Furthermore Aronia juice showed a beneficial effect on HbA1c-glycosylated haemoglobin, total cholesterol and lipid levels . These findings go in line with reports showing an effect of other procyanidin-rich foods on diabetes , , . Recent human studies also document that Aronia juice may be useful in in the treatment of obesity disorders . In conclusion, chokeberry (Aronia melanocarpa), a lesser known berry fruit, is one of the richest plant sources of highly interesting phenolic phytochemicals including procyanidins and anthocyanins. The high content as well as the pattern of the phenolic constituents seems to be responsible for the wide range of its potential medicinal and therapeutic effects. Further studies are needed to understand the beneficial effects reported so far also from the mechanistic point of view. However, it seems desirable that the spread and popularity of Aronia food products in the future will increase and expand consumers’ choice for healthy berry fruits. Pictures of Aronia berries, Aronia shrubs and Aronia plants in bloom are available as Supporting Information. The authors would like to thank the German Federal Ministry of Education and Research (BMBF) for financial support of the joint project ”Dietary procyanidins” (grant 0313828A). We also thank M. Rychlik, TU München (Germany) who measured the folate content of the chokeberry juice. The picture of the Aronia plants in bloom was kindly provided by J. Holzmüller.